You’re drawn to become a Pilates instructor because you want to be able to help people transform themselves physically and mentally through Pilates. But first, you have to transform yourself into a Pilates instructor. As a Pilates Instructor you will earn a great income working flexible hours in a positive environment with people who want YOU to help them transform themselves physically, and mentally with Pilates. Whatever your reason for wanting to become a Pilates instructor — whether you’re sick of your current job or you simply want to enrich your fitness and wellness knowledge — you’ve found the best place to do it. When you are considering obtaining pilates certification, it is important to choose from only those pilates certification courses that are properly accredited. Accreditation is an important concept in higher education. In a nutshell, it means that an independent authority (usually a national government, sometimes a state government, and more rarely a private organisation that is internationally respected as a legitimate accreditation body) has vouched for the quality of education and training provided by the course. That can make a huge amount of difference to how employers and academic bodies view an individual’s credentials. Without proper accreditation, nobody can be really certain that you are trained to the highest standards of professionalism. Breathe Education is the most reputable “become a pilates instructor” college in Melbourne that provides nationally accredited training in pilates certifications. Offering study at Certificate IV level and Diploma level, the courses at Breathe Education are genuinely impressive. They use a combination of online learning and practical classroom workshops where you can get a real hands-on education. In this way, you can study at your own pace and also ensure that you get a really in-depth learning opportunity. Of course none of this should give you the impression that the courses are ridiculously easy or that you won’t have to work hard to get your qualification. These are serious courses designed for those who are sincerely interested in working as certified pilates instructors or clinical therapists, so it is important to ensure students are properly prepared to work in such an important and responsible role and we are certain that this is possible with courses like our Diploma of Clinical Pilates. Breathe Education requires students to be fully committed to the goal of passing their courses honestly and with integrity, as indeed any reputable institution of higher learning would require. In fact, this issue is not just about you, but also the well-being of people who would come to you as a client in the future for coaching, advice, or therapy. There is a responsibility to attempt to ensure that students who graduate in health and fitness related courses will uphold the highest levels of ethics and accountability. The principle of “do no harm” is very important. As a student in these subjects, you will learn a range of important skills that you will later be able to apply in your career. Everything you learn will be genuinely useful. At the most fundamental level, this includes a comprehensive study in theory and practice of pilates methodology. You will also learn how to design pilates programs for your clients based on analysis you would perform in situ, and you will learn how to design programs for both individuals and groups. Beyond that, you will learn important teaching skills and you will study matters of law, safety, and ethics. As you can see, these courses are genuinely challenging and interesting, and ultimately will lead you towards a rewarding career. This qualification is the PERFECT entry point to the professional Pilates teaching community. You’ll learn mat and reformer techniques from elite instructors who’ll teach you the latest, evidence-based ideas and research. When you’re finished, you’ll be qualified to teach — and you’ll be in hot demand from studios around Australia. Your Certificate IV in Pilates means you have a government recognized pilates qualification after just 150 hours of training. Whether you complete the Certificate or the Diploma, you will be furthering your knowledge and skills in Pilates. 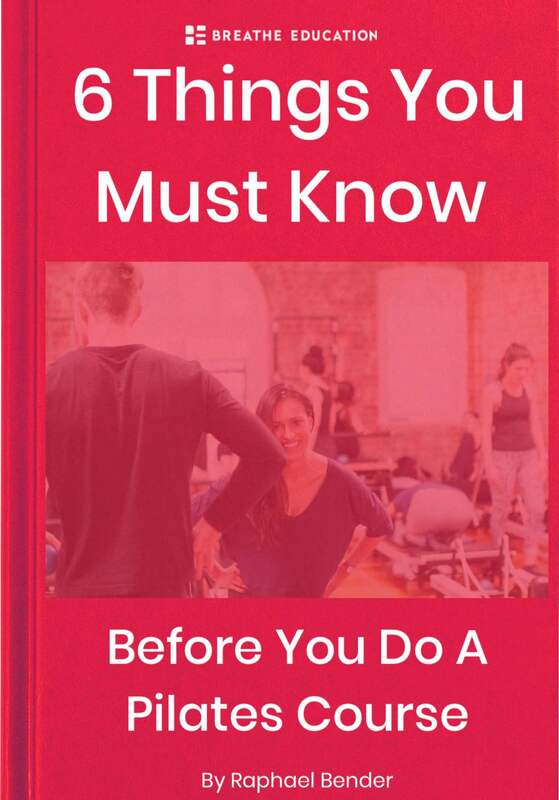 We educate you on everything you will need to be a successful pilates instructor, and equip you with the tools to provide a world class pilates service. The latest intake for Breathe Education’s Certificate IV in Pilates is open NOW.We have limited places for this intensive — and rewarding — course. For a limited time, you can get a free 20-minute Discovery Call with one of our Pilates Trainers. On the call we’ll review your individual needs, situation and career goals with you. Then, we’ll tailor a plan specifically for you and answer any questions you have about our course or about life as a Pilates Instructor.